Thapae Boutique House welcomes you. Tucked down a hidden side street in the center of old Chiangmai, we offer a sophisticated blend of contemporary Thai style and traditional Lanna culture. Modern touches such as English-speaking staff, free internet, and cutting-edge design are complimented by the timeless appeal of hospitality and cool breezes. away. Ancient temples and old Lanna-style teak houses abound in the winding small "sois" that make up the neighbourhood. Thapae Gate and the ancient moat that encircles the city are just down the street. Any and all travel or recreation needs are easily addressed in the plentiful surrounding agencies. For excursions further afoot, grab a bicycle or easily hailed" tuk-tuk". 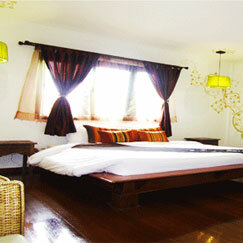 our easygoing tranquility can invoke an air of remote mountain oasis. Perfect for relaxing yet the city at your fingertips.